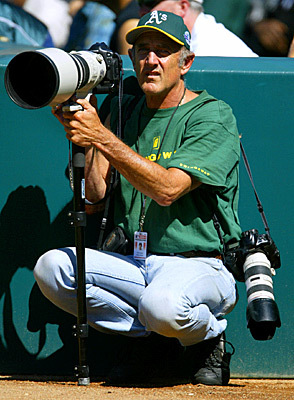 Michael Zagaris works an Oakland Athletics home game during the 2004 season. There is still space in THE coolest photographer event of the year: The Sports Shooter Workshop & Luau 2004. Nineteen different breakout classes and main speakers Rick Loomis, Matt Mendelsohn and Michael Zagaris highlight the program for this year's event, held at the Redondo Beach Marina Crown Plaza Hotel Nov. 5 - 6, 2004. "If you want to learn about how to shoot and light a knockout portrait or utilize your skills in video or get some cool little tips about digital workfow ... we have classes for you," says The Luau's Big Kahuna Robert Hanashiro. Other classes include: survival skills for the road, community journalism, picture stories and personal projects, web sites for photographers and the always popular Sports Shooter Jedi Master Series. Hanashiro indicates that the Workshop & Luau is nearly three-quarters filled and that it is open to both students and working photographers. "There maybe more expensive ones, but there is nothing that combines education, inspiration and so much fun like the Workshop & Luau. I wouldn't miss it for anything!" "I think seeing living legends like Bill Eppridge, Michael Zagaris and Peter Read Miller is worth the price of admission alone," Hanashiro added. Also added to the program is USA TODAY's director of photography Paul Whyte who will join the "Ethics In Photojournalism" panel and award-winning photographer Wally Skalij from the Los Angeles Times who will sit in on the Olympics panel. The trade show this year will include: Samy's Camera, Penn Camera, Roberts Distributors, Mamiya America, Lexar, Hassleblad, AquaTech, Lightware, Hoodman, Brooks Institute of Photography and Nikon. The Sports Shooter Workshop & Luau's is sponsored by Nikon.